R & R Roofing provides thorough home inspection services to assure your home is structurally and mechanically in check. Whether you're a homebuyer or realtor, you can trust R & R Roofing to apply an informed, unbiased eye to your future home. 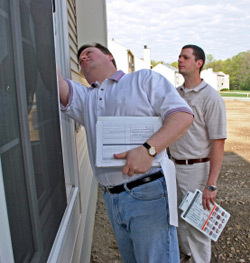 Our comprehensive home inspections include everything from roof inspection to air quality testing and much more. Don't trust that your dream home is flawless until it's R & R Roofing approved. We're qualified, certified, and educated so you can trust that we will deliver thorough, accurate inspection services. If you're in need of a home inspection, don't hesitate to Contact Us to schedule an appointment.